I prepared this sodhi, just for its fancy name and to find out, is the fancy name worth for it. Well it’s certainly a rich dish with lots of coconut milk and lots of vegetables that makes perfect to serve for son-in-law to impress him. 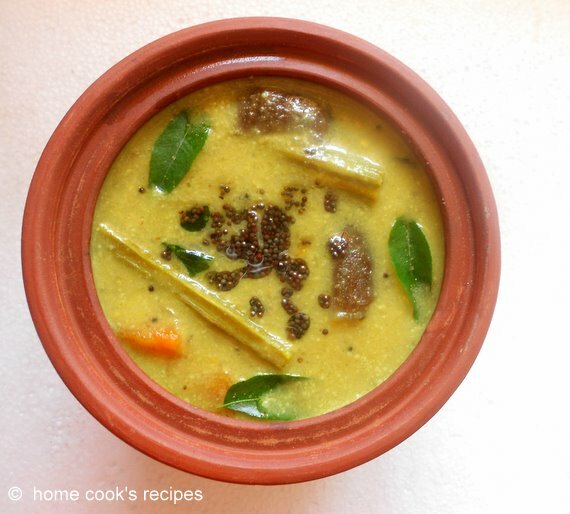 Vegetables cooked in coconut milk makes this kulambu very delicious. what makes this different is, using green chilly and using moong dal/roasted gram for thickening this kulambu. 1. First, chop the vegetables, brinjal, drumstick, carrot, potato and beans into big chunks. Chop the onion, ginger and garlic finely. Extract coconut milk. Make sure you have first pressed coconut milk about 1 cup separate from the second pressed coconut milk 1 cup. if you are using store bought coconut milk, use 1 cup as it is and dilute 1/4 cup of coconut milk with 1/2 cup of water. 2. Heat a pan, add 2 tsp oil, add green chilli and sauté it for at least 1 minute till it turns soft. 3. Remove the green chillies and add finely chopped ginger, garlic, fenugreek seeds and sauté them well. Next add finely chopped onions and sauté till it turns translucent. Now add the chopped vegetables, green peas and sauté along with the onions for at least 3-4 minutes. Add turmeric powder, salt for the vegetables and mix it. Add 1 cup of water and second pressed coconut milk to the vegetables and let the vegetables boil for 10 minutes in medium flame. to cook drumstick it takes 10 minutes, if you are not using drumstick, then let the vegetables cook for just 6 minutes. 4. Now grind the sautéed green chillies along with roasted gram dal/pottukadalai with little water into a fine paste. 5. 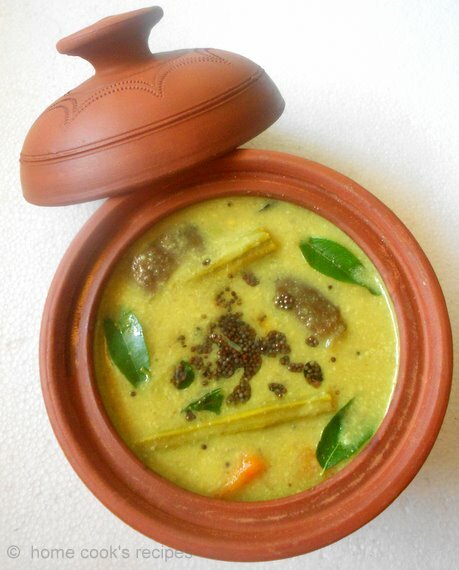 Check whether vegetables are cooked or not, if cooked add the grinded roasted gram/ pottukadalai paste and give a mix. Turn the flame low. Now add first pressed coconut milk and let the sodhi boil in low flame. It takes 1 or 2 minutes. Once it boils, remove the sodhi from flame. Add lemon juice and give a stir. 6. Heat a small tempering pan, add ½ tsp oil, add mustard and let it splutter, and then add curry leaves. Transfer the tempering to the sodhi. 7. Serve with hot steamed rice, potato roast and with some ginger chutney. 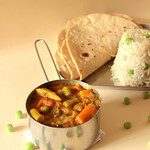 You can choose any vegetable, or this sodhi can be prepared as a plain one without any vegetable. 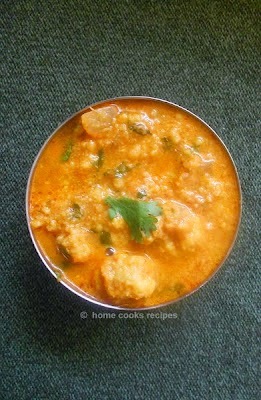 Many people add cooked moong dal (1/4 cup) to this sodhi. you can try that and avoid using roasted gram. So what did your mom cooked first for you husband? Friends, Love to hear from you. My hometown is tirunelveli and as you said this is a very special recipe for newly married (especially for vegetarians). My mom is an expert in this recipe and we can't resist ourselves from eating it. Its a very tasty recipe. 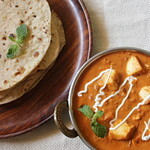 Very delicious and rich dish..
Hi Lavi, this looks rich and delicious. Perfect utensil used for serving it. If you want you can link it to my event. Delicious looking recipe, sounds so yummy n healthy. My grand parents are from Tirunelveli. My sister is an expert making this. Just one correction to this recipe. We don't mix roasted gram / pottukadalai. We add cooked and mashed moong dal / paasi paruppu after the veg. are cooked. I must try this variation. It looks really good. Pot looks very cute. I have been meaning buy a pot like this for a while. Could you please let me know where you bought it? 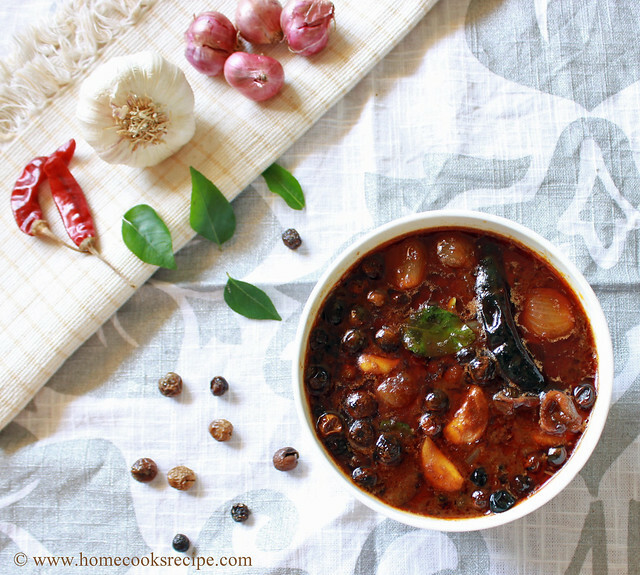 My friend makes this so well and she always pairs it with potato roast and inji chutney - lovely combination. Looks very impressive and appetizing too! I'm sure you had no problem getting son-in-law to eat lots and ask for more! 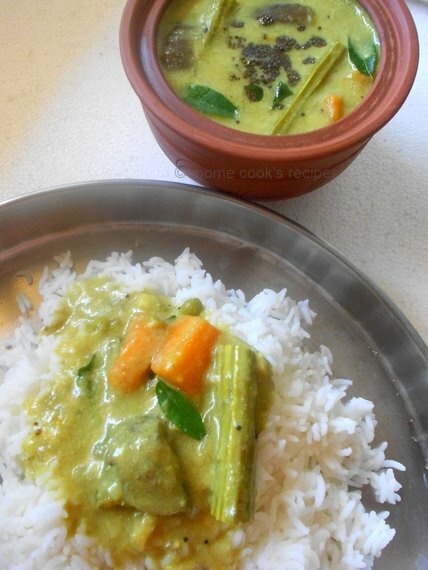 I love Sodhi Kulambu too .. my mom makes this absolutely amazing .. this looks so good and love your pot. Great article. Great food information. Good preparation method. Thanks for sharing this information.